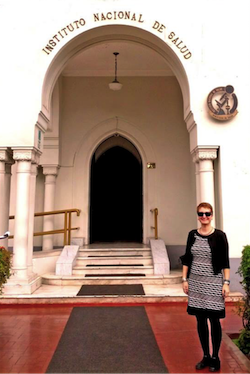 Jennifer Wisdom presented to the Instituto Nacional de Salud [Peru’s National Institutes of Health] in Lima, Peru, on “Promoting and Funding Health Science: University and Federal Research Infrastructure in the U.S.” in August, 2014, and to the International Center for Advanced Research and Applied Science on grant preparation in April, 2014. The presentations were part of ongoing initiatives to explore opportunities for collaboration between U.S. researchers, students, and practitioners and Instituto Nacional de Salud, Instituto Nacional de Enfermedades Neoplásicas (Peru’s National Cancer Institute), and the International Center for Advanced Research and Applied Science. The initiatives resulted in letters of agreement between George Washington University and each of the Peruvian organizations to facilitate training. Link to announcement (in Spanish) of GW-INS agreement.